Stock photo of a handmade wooden drum by Trevor Hunt, First Nations Artist, featuring Wildman (Pugwis) and the Killer Whale. This piece is on display at the Just Art Gallery in Port McNeill, Northern Vancouver Island, British Columbia, Canada. This stock photo shows a Native Art Drum made by Trevor Hunt featuring Wildman (Pugwis) and the Killer Whale. This artistic tradition continues to be passed down through the generations and is reflected in the work of each artist, showcasing their rich heritage while imparting an insight into their own personal interpretation. The materials used during the creation of these authentic Native American art works are Red Cedar, Yellow Cedar, and Alder. Trevor Hunt was born March 9, 1975. He is part of the great Hunt Family of Fort Rupert on Vancouver Island in British Columbia, Canada. 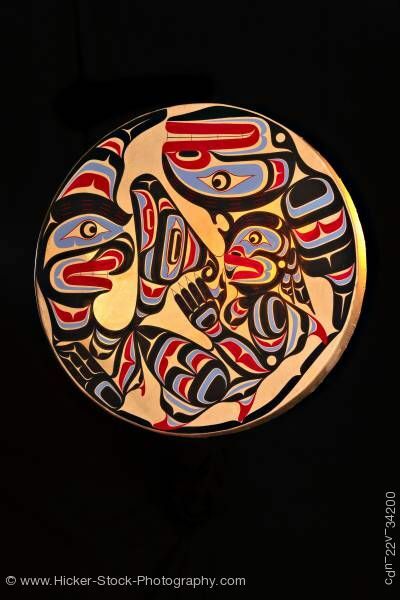 He comes from a long line of hereditary carvers and artists that have been instrumental in the survival of the Kwaguilth art form on the northwest coast. His father is Stan Hunt, his Grandfather was Henry Hunt and his great-grandfather was Mungo Martin. He has been painting original graphic interpretations of Kwaguilth myths and stories since he was 10 years old and in 1997 began carving in wood under the tutelage of his father, Stan Hunt and his brother Jason Hunt. His teachers include Tim Alfred and David Knox. He has recently completed a 38-foot painting of a Killerwhale on the roof of a resort in Telegraph, B.C. and designed the logo for the Thunderbird Shopping Plaza in Port Hardy, B.C. This unique native art piece is "property released" by Native Art Gallery - JustArt.